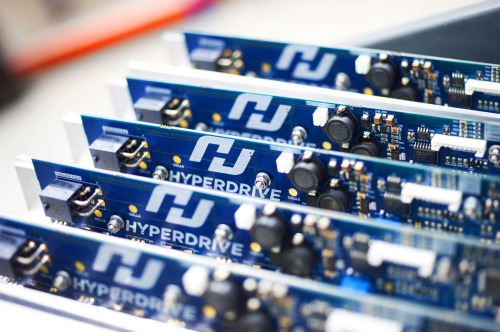 Hyperdrive Innovation’s battery energy storage systems could contribute to making the V2G vision a reality (image courtesy of Hyperdrive innovation). 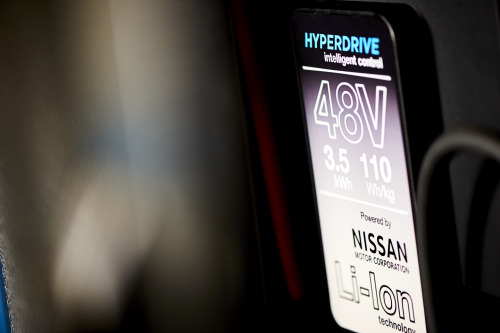 Hyperdrive and Nissan are collaborating in the creation of lithium-ion battery systems for electric vehicles (image courtesy of Hyperdrive). Image courtesy of Hyperdrive Innovation. Stephen Irish at Hyperdrive Innovation takes a look at the electric vehicles market in the UK and the role it could play in alleviating a potential energy supply crisis. According to a recent report by the Institution of Mechanical Engineers, the UK may face an electricity supply gap of up to 55% in 10 years’ time. The report states that the government’s recent energy policies have called for the closure of all coal-fired power stations by 2025 but with insufficient measures available to replace the lost capacity, particularly at times of peak demand. In short, the report states that the UK is heading for an ‘energy supply crisis’. Accessing the energy stored in electric vehicles (EVs) when not in use, could play a vital role in addressing this imbalance, advancing further the energy connectivity landscape under the vehicle-to-grid (V2G) concept. V2G refers to the reciprocal flow of power between any electric or hybrid vehicle and the grid. In addition to the low carbon future that V2G supports, it also introduces the prospect of financial incentives for the consumer, through offering frequency regulation and energy storage facilities to the grid. The energy stored in the vehicle can be used to avoid peak tariffs at times of high demand and optimise the value of electricity generated from domestic renewables such as solar panels, to reduce home electricity bills. According to research produced by the global engineering consultancy Ricardo and the National Grid on grid balancing measures, V2G could provide £600 to £8,000 of income each year for vehicle owners. This would be a significant incentive for additional EV uptake, not to mention that EVs are also road tax free. The government’s Plug-In Car Grant which provides a 35% grant towards the cost of new EVs for new buyers provides further encouragement. Furthermore, the recent warning by the UK Energy Research Centre (UKERC) of the ‘need to build much greater flexibility into the power system’, refocused the attention on renewables, such as wind and solar which create energy but not always when and where it’s needed. Although an increased take-up of renewable sources would be a welcome development, the intermittent availability of these sources means a more drastic approach is needed. A holistic, ‘smart’ approach to EV use, energy generation, storage and distribution will ensure that the supply and demand gap is more effectively managed. Innovations such as home battery energy storage products, offer the opportunity to scale-up dispersed energy storage capacity and maximize local energy use in a fully connected home energy network. A 4kWh battery, for example, would be able to provide a third of the energy needs of a typical home in the UK. In light of the fact that the RAC Foundation stated that privately owned vehicles in the UK are parked 96% of the time, adding to grid storage capacity by utilising the batteries in electric cars plugged in when not in use makes perfect sense. Clearly, the electric vehicle must still be available with sufficient charge when needed for transport and there are a number of early-stage smart charger and V2G trials ongoing looking at how this all might work in practice. The existence of the trials show that the technology exists on and off the car but it isn’t always suited to every application. There are challenges yet to be overcome for example, in UK based domestic charging applications. UK-based Cenex, a low carbon and fuel cell technologies consultancy, is leading a project to integrate V2G technology into existing energy infrastructure at the district and city scale in Birmingham, Berlin and Valencia. The project aims to deliver a reliable assessment on network impacts and business case for V2G. The dramatic increase in EV sales over the past two years, according to recent figures released by the Society of Motor Manufacturers and Traders (SMMT), combined with rapidly declining technology costs means that EVs can move away from being another challenge for our aging grid infrastructure to becoming managed loads and ultimately dispersed storage capacity as part of a revolutionary decentralised energy system. Energy is stored close to where it will end up being used and local resources are utilised in the most effective way possible. The automotive sector is taking seriously the idea that owners can be compensated for using their vehicles as a way of achieving cost-parity between EVs and gasoline or diesel vehicles with regulatory pressure to deliver zero-emissions vehicles. The battery in an EV is the most expensive component – typically 227 per kWh in 2016, according to a recent report by McKinsey – and designed to the stringent standards of the automotive industry. It can comfortably handle the demands from the grid and, in some cases, this functionality has already been enabled. EVs currently manufactured by Nissan and Mitsubishi already offer on-board V2G compatibility to help balance supply and demand when used alongside smart chargers. 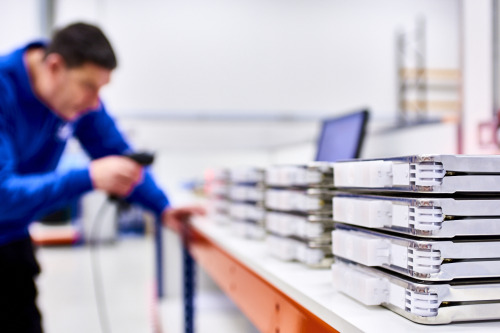 A recent collaborative project between Nissan, energy company Enel, and California-based company Nuvve is the first of its kind to commercially integrate and host V2G units at its headquarters in Copenhagen. A number of EV’s and charging stations are now providing commercial V2G services in the city. Other automakers such as BMW and Honda are following suit through building relationships with commercial participants and research and development hubs. In summary, there remain some important challenges to be overcome in the progress of implementing V2G en masse. Advances in technology, a commitment to developing a clean energy infrastructure and strong economic and environmental incentives for the consumer need to be fully materialised and widespread. However, developments such as Hyperdrive Innovation’s battery energy storage systems, namely its intelligent Li-on technology, are contributing to making the V2G vision a reality. Hyperdrive’s modular battery systems are being adopted by a wide range of niche vehicle manufacturers and can also be incorporated into stationary energy storage systems to work alongside as part of a smart home energy network. Hyperdrive’s partnership with Nissan, developing modular battery systems for both electric vehicles and stationary energy storage is closing the gap between two traditionally very different industries using common technologies and a collaborative, strategic approach. Stephen Irish is MD of Hyperdrive Innovation.